A member of the 8-hectare Tjankwa Irrigation Scheme, in Plumtree District, 100km west of Bulawayo, Zimbabwe. Credit: Busani Bafana/IPS. 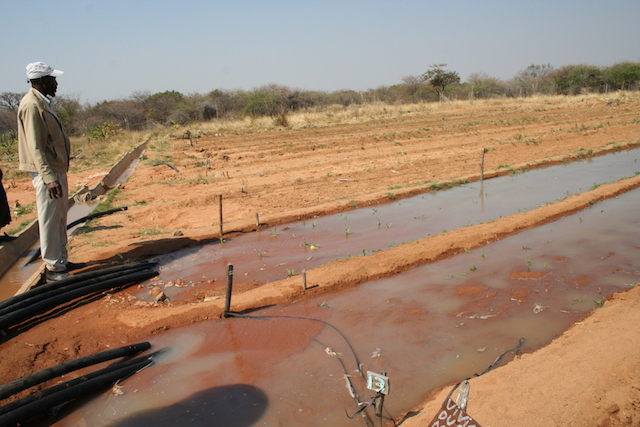 “Irrigation has helped us produce more vegetables and crops and to increase our income which we would not do if we relied on the seasonal farming when we have rain,” Ndlovu said. “We are currently able to grow two crop cycles a year, meaning we double our output annually. In addition to this our grain yields are always higher in our irrigated crop. Corn cobs fill up completely to the tip, translating in higher yields,” Koku said. Badiane said irrigation development will help deliver on the food security and nutrition targets under the African Union’s Agenda 2063 and the Malabo Declaration. A critical factor was getting the buy-in of decision makers at the highest level of government who need proof that irrigation works. 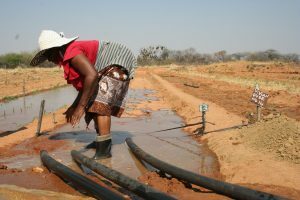 “Africa, in particular, will require nothing short of a complete water transformation,” says Nathanial Matthews, Programme Director at the Global Resilience Partnership a partnership of public and private organisations that work together to build a resilient, “sustainable and prosperous future for vulnerable people and places”. “Taking action is urgent, with 95 pe cent of the continent relying on rain-fed agriculture and 25 countries already experiencing widespread hunger, poverty and under nutrition,” Matthews told IPS. Rita Levi-Montalcini, the Italian Nobel laureate honoured for her work in neurobiology, once gave a splendid conference with the title “The imperfect brain”. There she explained that man has a brain that is not used completely, while the reverse is true for the cockroach. In the growing fog that envelops the planet and its inhabitants, looking at things from the point of view of a cockroach would probably give us a new perspective. Also because the cockroach survived the atomic bomb in Nagasaki, it is 300 million years old, and it is distributed around the planet in over 4,000 species. All things that give it a great advantage over man. Obviously, both are part of the animal kingdom. But man does things that other animals do not. For example, torture. Man has a level of consciousness and intelligence that no other animal possesses. But he does not, for example, learn from mistakes, which all other animals do. Today, 70 years after its adoption, we are celebrating the Declaration of Human Rights, but we are recreating all the conditions that led to the Second World War, so much so that we talk about the “New Thirties”. We have returned to waving the well-known flags of “In the name of God” and “In the name of the nation”, flags under which millions of people died. We have been questioning ourselves about the climate since the 1992 Rio de Janeiro Conference on Environment and Development (UNCED). Rio de Janeiro gave rise to the Kyoto Protocol for the control of climate change which, despite its good intentions, has had negligible results. Finally, after years of negotiations, we managed to convene the United Nations Climate Change Conference (COP 21) in Paris in 2015, with the participation of all the world’s countries. For it to happen, every country was left free to set its own goals for reducing carbon monoxide emissions and responsible for monitoring their application. (Just think what would happen if we left citizens the same rules for their taxes). We now know that the result of the commitments made in Paris is leading to a 3.6°C increase in the planet’s temperature. Since 1992, the work of climate scientists has been to calculate how far the temperature can rise from the days of the Industrial Revolution without causing too much damage. The consensus is 1.5°C, and that at more than two degrees the consequences of heating become irreversible and escape man’s control. For example, the permafrost of Siberia would melt, releasing a quantity of methane, an element 25 times more harmful than carbon monoxide. And the Paris agreement does not include methane, which is already massively produced by livestock farms, planes, ships and much more. Long before the Rio Conference, in 1988, the World Meteorological Organisation (WMO) and the United Nations Environment Programme (UNEP) had created the Intergovernmental Panel on Climate Change (IPCC), which brought together the climate scientists of 90 countries to present reports on the state of the climate. These reports have progressively identified human activity as responsible for the increase in temperature, obviously with the opposition of the fossil, oil and coal sectors. But the figures speak clearly. CO2 emissions have continued to increase, even after the Paris Conference. And the latest report of the 2018 “emissions gap report” sounds a brutal alarm: at the current rate, we need to triple efforts to stay within the famous 1.5 degree mark, because we will get there within the next 12 years. Only 57 countries are on the correct path. Now we have entered into the realm of myth. That of indefinite development, in which science and the market will be the saviours of the planet. The Trump administration has even presented a report to the annual Conference of the Parties (COP) defending fossil fuels, with the support of producer countries (Russia, Saudi Arabia, etc.). As for science, there is no doubt that it is playing a positive role. But science has become a market variable. If its findings are not used, they count for little. And history shows us that the free market uses them only if they can give immediate profits and do not create conflict with the sources of profit already in use. An easy example is that of the automotive industry. Without the progressively introduced regulations, we would have cars that are much inferior to those of today if we were to increase their safety and efficiency, and reduce their pollution. And the myth of the efficiency of the free market, which has been left without checks and controls since the fall of the Berlin Wall, has created some winners, but many losers, who wear yellow jackets and bring revolt to Paris. To keep to the theme, total subsidies to the fossil industries currently amount to 250 billion dollars a year, while those in the renewables sector now stand at 120 billion… and the Joint Research Centre (JRC), the European Commission’s science and knowledge service, has calculated that inaction on climate change will cost Europe 240 billion euro a year, with southern Europe as the major victim. Moreover, this is the common thread that connects us with two other major events of December 2018 – the United Nations conferences in Katowice, Poland (on climate change), and Marrakech, Morocco (on migration). These, along with the revolt of the “yellow jackets” in France, mean that this month will go down in history as the date on which the international system formally entered into crisis and the revolt of the excluded can no longer be ignored, with Trump as a central protagonist. This was enough for the quick formation of a coalition of sovereignists, xenophobes and populists who boycotted the agreement. After Austria, here come Hungary, Poland, Slovakia, Czech Republic, Croatia, Switzerland and Trump’s allies, such as Israel, Australia and Chile. And it is here that migration, like the climate, becomes something that is of the left… and the Belgian government loses the far-right party of Flemish autonomy and is forced to redo its coalition, because it decides to participate in the Marrakech conference. And Germany and Italy pass the buck to their parliaments. All this over a non-binding document of principles! And now comes a new category that does not exist legally: that of environmental refugees who, according to the European Union number 258 million people, forced to leave their homes for climatic reasons. But this is a whole new and difficult discussion. While it is clear who are the victims of a hurricane or an earthquake, it is more difficult in the case of desertification. Let’s think about the case of island countries like the Maldives where an increase of just one metre in sea level would be enough for them to disappear physically. You can send an immigrant who comes to another country to escape hunger back to Senegal for example, but where do you send back people who no longer have their country? One of the laws of physics is that of communicating vessels. Africa will double its population in a few decades. Nigeria alone will grow to 400 million inhabitants. Sixty percent of Africans are under 25, compared with 32 percent for North Americans, and 27 percent for Europeans. According to the United Nations, Europe will need at least twenty million immigrants to maintain its pension system and its competitiveness. Even Japan, which has always struggled to keep its identity and ethnic and cultural purity intact, is opening its doors without fanfare in the face of the aging of its citizens. European statistics are public, but ignored. In Italy, immigrants totalling five million out of a population of 60.6 million have produced 130 billion euro, 8.9 percent of the country’s gross domestic product, an amount larger than the GDPs of Hungary, Slovakia and Croatia. And Italy now has seven births against 11 deaths. In the last five years, 570,000 new businesses out of six million have been created by immigrants in Italy, and the complaint of entrepreneurs, especially in agriculture, is that an Italian workforce cannot be found. At global level, according to William Swing, former director-general of the International Organization for Migration (IOM), although immigrants account for only 3.5 percent of the world’s population, they produce nine percent of the world’s GDP. But this is not what people believe. According to a survey by the European Union on the myths and reality of immigration, Italians believe that immigrants account for 20 percent of the population while the figure is actually 10 percent. They believe that 50 percent are Muslims while they are really 30 percent, and that 30 percent are Christians while they are 60 percent. They also believe that 30 percent of them are unemployed while the figure is 10 percent, not far from the national average. These Italian myths are actually shared by the whole of Europe, and with Trump by the United States. Fox News, Trump’s television arm, now refers to immigrants as “invaders”, and Trump wants to erect the most expensive wall in history, after the Great Wall of Chinese, to keep out criminals and drug traffickers. And here comes the central theme of this article, which is too short to deal with issues that are apparently unrelated to each other in an effective way. Who elected the Trumps, the Salvinis, the Orbans, the Bolsonaros, and who sees peace and the fight against climate change as leftist positions, international cooperation as a plot in favour of the Chinese and immigrants as invaders? Well, the Catalan nations where a far-right party, born from nothing, won 400,000 votes can be very useful for understanding the revolt of the “yellow jackets” in France. How was this anger reached? It was not born today, but has been created over three decades. With the fall of the Berlin Wall, the threat of communism has disappeared, social concerns have fallen, and the market has replaced man as the central element of society. Spending that is not immediately productive (health, education, assistance for the elderly) has been progressively decreased. The rich, because they are productive, receive a progressive reduction in taxation, unlike the poor. Globalisation has led the rich to become richer, and the poor poorer; it has delocalised businesses and reduced the purchasing power of the middle class, while finance has grown in a world of its own, free from business. The class of craftsmen/women and small traders is disappearing, if it has not already disappeared, devoured by the likes of IKEA and supermarkets. Cities become increasingly important, and the countryside increasingly empty and poor. A farmer’s product is sold to intermediaries for one-quarter of the final price. Where voters once identified themselves with a factory, with a trade union, with a community of peers, today they are atomised in a vacuum without incentives. And because, after the end of the Soviet Union, the new ethics is to become as rich as possible (today 80 people possess the same wealth as 2.3 million people) and the value of individual competition is increasing the frustration of the losers. Finally, the financial crisis of 2008. This struggle leads, for example, to Brexit, where cities vote to remain in the European Union and the countryside to leave, something that was repeated recently in the Polish elections. It is the same policy of fear and redemption of the losers that led to the power of Trump, who lost in the cities, in the rich states, and won among the poor, in the rural world, in the world of closed factories and abandoned mines, among voters motivated by rancour, anger and fear. In all small cities, the phenomenon is the same. An investigation in Montauban, one of the most active towns in the “yellow jackets” revolt with less than 60,000 inhabitants, found that there were 27 butchers before the arrival of Carrefour. There are four left. The same happened with greengrocers, with many clothing stores and craft workshops after the arrival of supermarkets. In all, around 900 shops had closed down. Respected citizens considered middle-class suddenly found themselves marginalised and ignored. Through television, they basically see programmes from cities and a world that is changing in which they have no future. Is it any wonder that this turns into resentment towards the system and those who belong to it? Le Monde has published a table on salaries, which shows that those in a higher intellectual profession earn an average of 2,732 euro a month, which falls to 1,672 for farmers, artisans and traders, but plunges to 1,203 for those in precarious activities. And the “yellow jackets” revolt was triggered by a 10 euro cent increase in the tax on diesel fuel. One of the demonstrators’ slogans was: ‘Macron fears the end of the world, we fear the end of the month’. Now, to remain in France, Macron has failed to understand that for the losers rational analysis of efficiency increases their estrangement. Life is above all a human fact, and no one is concerned with this aspect any longer. Schumpeter’s model – that the efficiency of the market creates a process of economy that grows thanks to the market’s capacity for creative destruction – is for the losers proof that the system is made only for the winners, and that neither they nor their children will ever have the ability to escape the situation in which they have come to find themselves through no fault of their own. The ‘Yellow Jackets’ movement has been very successful, because many categories feel ignored. When frustration increases with the passing of the years, of governments, and is reduced only to an economic problem of subsidies, the passage to violence, from dignity that is awakened, is unstoppable. And those who present themselves as “the man of providence”, capable of listening and understanding, opening fights against corruption, for the restoration of law, for traditional society, for the world in which everything went well – from the old independent Britain to the great factories and steel mills of the United States – will have unshakable support. In reality, there was once a social contract, also regulated by intermediary forces such as trade unions, by a sense of hope and collective identity, such as being a worker or a railwayman. This sense of community has disappeared, almost all places of aggregation have disappeared, such as clubs or dance halls, replaced today by the halls of supermarkets and discos, to which only young people have access. It would also be necessary to open a chapter on the impact of technology, with internet and social media, which instead of leading to greater communication, have led to a self-referential and narcissistic world, where each one organises their own virtual world, escapes from real society, creating aggregations among peers and no longer dialogue with others. Another instrument that is felt as exclusion for generational reasons. Even though the revolt of the ‘Yellow Jackets’ was made possible by Facebook, which brought together hundreds of thousands of people aggregated against the common enemy: the system, which ignored and marginalised them. However, it should be clear that robotisation and artificial intelligence will put more people on the margins of society than immigration ever will, with new priests of the system, technicians who will manage the world of artificial intelligence. It is thus now clear that without social justice, we will not go far. Macron who lifts taxes from the rich to attract investments to France lives in a world that is different from that of most of its citizens. And above all, in a world of numbers and Excel tables. A world in which “men of providence” will lead us inexorably towards a war. Exploiting fear and injustice works politically for obtaining votes. The battles of the losers of globalisation have been opened by social movements, by the World Social Forum. But who uses them is not the left, which with Tony Blair’s ‘third way’ thought it could ride the wave of globalisation, when it only managed to lose its base: the battle of the losers is used by right that is not ideological but of the gut. Moreover, as always in a world that has lost its compass, the money would be there. Every year, countries’ tax authorities collect 150 billion dollars less than they could because of tax havens that could easily be outlawed in a very short time. It is always the same: if we could introduce social justice as the first objective, it would be easy, even on a global scale. The United States, for example, spent the absurd sum of 5.9 trillion dollars in military operations and armaments after the attack on the Twin Towers. In 2017, 1.719 billion dollars were spent on armaments worldwide, a figure never before reached in history. And if military expenses could be considered necessary by some, I do not see who defends the spending for corruption: in the last year, according to the United Nations, this amounted to one trillion dollars, and the money stolen in governments another 2.6 trillion. Another proof of the efficiency of the free market! And now let’s go back to our cockroach. According to scientists, we are heading towards the sixth crisis of extinction of the animal and plant kingdom. Extinction is a natural phenomenon, affecting one to five species each year. 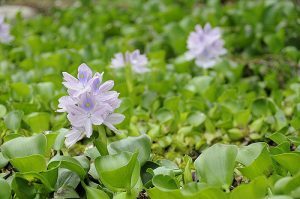 But scientists estimate that the current rate is at least a thousand times higher, with dozens of species every day. It is believed that by the middle of the century at least 30 percent of existing species will have disappeared. And our cockroach can only desire that the bunglers of the animal kingdom, called men, get out of the way as soon as possible. The entire animal and plant kingdoms, and probably also the mineral one, are asking for this. The Trump administration’s plan to reduce its 22% assessed contributions to the world body –- mandatory payments to the UN’s regular budget– has helped resurrect a 1985 suggestion by the late Swedish Prime Minister Olof Palme who proposed a new system of financing the UN. The Palme proposal did not renounce the existing “capacity to pay” formula, but suggested there should be a cap of 10 percent maximum for any one country. This cap is intended to reduce the UN’s excessive dependence on funding by the US and a fistful of big donors. The spirit of the Palme proposal is to protect the UN from being unduly influenced by these donors. According to the current formula, besides the 22% by the US, the percentage for the other major contributors include: Japan pays 9.7 %, China 7.9%, Germany 6.4%, France 4.9 %, UK 4.5%, Italy 3.7% and Russia 3.1%. Kul Gautam, former UN Assistant Secretary-General and Deputy Executive Director of the UN children’s agency UNICEF, is a strong advocate of the Palme proposal and argues that if UN decision-making is to be freed from excessive vulnerability to, and even being blackmailed by the big donors, it is important for UN not to be too dependent on any single donor for its overall budget or important projects. In an interview with IPS, he pointed out that former Secretary-General Ban Ki-moon was compelled to change his report on Saudi Arabia’s blatant targeting of children and civilians in its attacks in Yemen a few years ago, because of the Saudi threat of withholding its funding for the UN. Similarly, in 2005, former Secretary-General Kofi Annan was compelled by then US President George W Bush to appoint an American Executive Director of UNICEF within 72 hours —without any serious vetting by the UNICEF Executive Board. A clear case of influence-peddling, and “cheque book diplomacy,” said Gautam, author of the recently-released book titled “Global Citizen from Gulmi: My Journey from the Hills of Nepal to the Halls of the United Nations”. James Paul, who served as executive director of the New York-based Global Policy Forum (1993-2012), told IPS that on 21 October 1985, in a speech to a General Assembly commemoration of the UN’s 40th anniversary, Olof Palme proposed that the cap on maximum assessment by any one country to the UN’s regular budget be reduced from 25% to 10%. 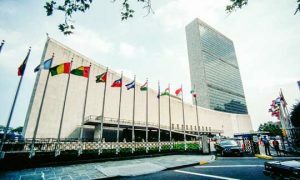 The UN at that time was facing a growing financial crisis, due in large part to a growing debt by the United States; Palme was proposing an unconventional solution. 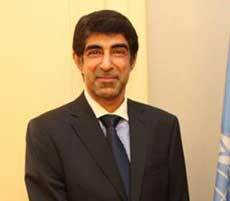 A number of countries agreed with Palme and a high-level UN reform paper took up the idea. The German government argued with Washington that the United States should pay up– or accept a lower assessment. In 2001, the US altered course and agreed to pay the UN most of the outstanding US debt if its regular budget dues rate was lowered to 22%, from 25%. That shift was, of course, far from the Palme idea. Outsize US financial influence continued. “The 2001 changes are very relevant today, as yet another UN financial crisis is upon us and Washington is yet again the main culprit, said Paul”, who for many years was also an editor of the ‘Oxford Companion to Politics of the World’. Could the distribution of dues be changed further in the direction that Palme suggested? The process leading to the 2001 change proved that under the right circumstances other member states could be persuaded to come up with an additional share of the dues, he noted. Even at that time, he said, the US was very strongly opposed to the idea. Gautam said: “I am not in favour of the argument that because the US economy is strong right now that it should be asked or expected to pay more to the UN”. That, he pointed out, would be contrary to the spirit of the Palme proposal. Any shortfall caused by capping the US contribution to the UN can be easily made up by other OECD countries (Organization of Economic Cooperation and Development) and the large number of middle-income emerging economies, without putting undue burden on the worlds low-income countries and LDCs. “Please remember that in the larger scheme of international finance, in a world economy of $77 trillion and global military budgets of $1.7 trillion per year, the totality of the UN system’s budget and expenditure for humanitarian assistance, development cooperation, peace-keeping operations, technical assistance and other essential normative functions, amount to about $48 billion per year,” he pointed out. This is a modest amount to respond to the huge challenges that the UN is asked and expected to help tackle. He said the total UN system-wide spending annually is less than the defense budget of India or France, and less than one month’s US spending on defense. Today financing for development landscape is changing rapidly. Many UN activities benefit from private sector financing and philanthropic foundations. Many NGOs rely increasingly in cloud-sourcing and crowd-funding as well as different modalities of public-private partnerships. Harnessing such possibilities and exploring the utilization of schemes like the Tobin Tax and resources generated from the global commons that are supposed to be the common heritage of humanity should be seriously explored to liberate the UN from the perpetual threats of arbitrary cuts by its current major donors, declared Gautam. That’s why his voice on this issue was so influential, because he was balancing that principle against others he considered more important – the viability of the United Nations and the protection of the UN from pressure from the largest payer. Can the Palme concept be applied today when yet another UN financial crisis has arisen and a US administration of unprecedented hostility to global cooperation is in power? It would be worth trying, said Paul. And it may be an urgently-needed revision to the post-1945 arrangements and the world order that lay behind them. Other member states would have to agree to accept a larger share of the UN dues to make up for a reduction by Washington, said Paul. He said complaints that national budgets are over-stretched cannot be taken seriously, since UN dues are a very small number in all national budgets from the poorest to the very richest countries. Affordability is simply not the main issue. Washington might oppose such a change, so as to keep its financial influence intact, but the time has come for the rest of the world to stand up and defend a necessary change to strengthen an institution that they need and want. Adoption of the Palme proposal might be the first step towards other much-needed changes to make the UN stronger and more effective in the years to come, declared Paul. The assessment, conducted by reporting countries using a harmonized approach, shows trends in land degradation between 2000 to 2015. It is based on data gathered from 145 of the 197 countries that are party to the Convention. This is the most extensive compilation of official data on this subject since world governments agreed to tackle the problem of land degradation in 1994, and then adopted a binding agreement – the United Nations Convention to Combat Desertification – in 1996. Journalists wishing to cover the Committee meeting in January are invited to register and obtain accreditation through this online portal: https://reg.unog.ch/event/27508/. The secretariat of the UNCCD jointly with Guyana Land and Soils Commission will organize a media training for journalists on Sunday, 28 January 2019. A few Caribbean journalists who meet the required criteria will be sponsored for the training, and to cover the event. Interested journalists are reminded that the application deadline is this Friday, 21 December 2019. Detailed information is available here: https://www.unccd.int/news-events/deadline-extended-applications-cric17-media-training. 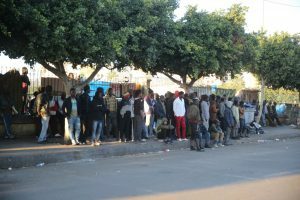 “Despite the difficulties I encountered at first, being in an irregular situation, I am working today in a private communications company after an operation launched by the Moroccan authorities to give residency permits to tens of thousands of immigrants living in the country illegally,” says Ahmadou, a Nigerian migrant, who has been living in Morocco for five years. At first, he was all set on reaching that supposed El Dorado for so many migrants: Europe. But now the situation is different. Ahmadou says professional integration is the key. If you have no job, he says, then the ambition to reach Europe will never disappear. The Compact seeks to ensure migrants enjoy rights within a global vision based on joint management of migration between countries of origin, transit and hosting. Maintaining dignity underpins this effort—both for migrants and countries at large—by establishing a set of principles fostering integration of migrants within societies, while giving states full sovereignty in the enactment of national migration policies. The process of integration lately has proved arduous in many countries—Germany becoming a poster child for such frictions after welcoming hundreds of thousands of migrants and refugees from strife-torn countries—especially when it comes to employment for migrants, resulting in high unemployment levels. Even if jobs are found, migrants in European countries are more likely to work on temporary contracts. Over time, though, the employment gap between migrants and native born does narrow in most countries, and even vanishes in a third, according to a report by the Organisation for Economic Co-operation and Development (OCED). Morocco is in a similar position to European countries having shifted from being a country of origins and transit to also one of destination for migrants. Hence Morocco’s authorities have launched a program through its Agence nationale de promotion de l’emploi et des compétences (ANAPEC)—which translates as the national agency for employment and skills—to facilitate access to job search assistance, provide employment assistance and promote work equity within companies. Its ultimate objective is to is to guarantee an honourable and dignified life for regularised migrants by ensuring equitable access to the labor market. But despite such measures, the number of migrants and refugees inserted into Morocco’s labor market remains limited. On any given day, young men from various countries in West Africa endlessly pace the streets around Marrakech’s iconic Jemaa el-Fnaa square and market place in the Medina quarter, amiably trying to hawk the likes of iPhones, watches, sunglasses and bright decorative shirts to passers-by. Hence calls to increase the ANAPEC services and benefits available to migrants, to mobilise and stimulate micro-credit institutions to finance income-generating activities and enterprises by migrants, and to improve communications to incentivise the private sector about the importance of recruiting migrants. “Parlais vous Francais?” one migrant, sits by his trinkets laid out on the street, says hopefully to a potential foreign customer walking by, asking if he speaks English. But a shake of the head and a school-boy French apology are all that follow. The migrant smiles and keeps waiting for another potential customer. 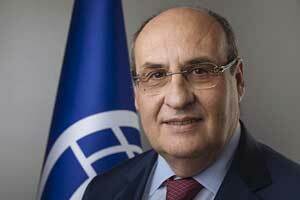 “Continuing to improve the conditions of migrants’ access to public services and rights, including the right to decent work, will push lots of migrants to realise their dreams here without the need to ride the waves of death across the Mediterranean,” Ahmadou says.